Also available in Arabic (العربية), Macedonian, Russian and Turkish! 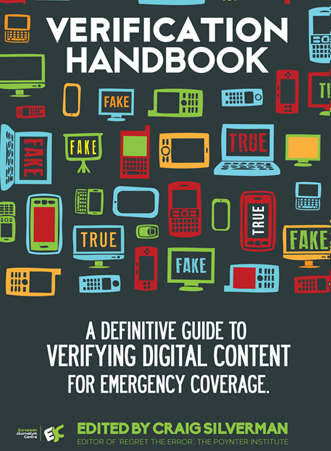 Authored by leading journalists from the BBC, Storyful, ABC, Digital First Media and other verification experts, the Verification Handbook is a groundbreaking new resource for journalists and aid providers. It provides the tools, techniques and step-by-step guidelines for how to deal with user-generated content (UGC) during emergencies. Or directly download the PDF, ePub or Kindle version. When a crisis breaks, trusted sources such as news and aid organisations must sift through and verify the mass of reports being shared and published, and report back to the public with accurate, fact-checked information The handbook provides actionable advice to facilitate disaster preparedness in newsrooms, and best practices for how to verify and use information, photos and videos provided by the crowd. While it primarily targets journalists and aid providers, the handbook can be used by anyone. Its advice and guidance are valuable whether you are a news journalist, citizen reporter, relief responder, volunteer, journalism school student, emergency communication specialist, or an academic researching social media. Craig Silverman is an entrepreneurial journalist and the founder and editor of Regret the Error, a Poynter Institute blog about media errors, accuracy and verification. He has also developed a course on digital age verification for the Poynter News University. Craig serves as director of content for Spundge, a platform that enables professionals to grow and monetise their expertise through content. Craig previously helped launch OpenFile, an online news startup that delivered local reporting in six Canadian cities. He is the author of Regret The Error: How media Mistakes Pollute the Press and Imperil Free Speech, and his work has been recognised by the U.S. National Press Club, Mirror Awards, Crime Writers of Canada and National Magazine Awards (Canada). He tweets at @craigsilverman. Steve Buttry is Digital Transformation Editor for Digital First Media. He has been an editor, reporter and writing coach for seven U.S. newspapers and had leadership roles at TBD.com and the American Press Institute. He has led more than 40 ethics seminars, workshops and webinars around the world. He was named Editor of the Year in 2010 by Editor & Publisher magazine. Buttry has pursued his 42-year journalism career across the United States and Canada and in Ireland, Venezuela, Mexico, Germany, Japan, Saudi Arabia, Ecuador, Siberia, France and Italy. He blogs at stevebuttry.wordpress.com and tweets via @stevebuttry. Claire Wardle is a Research Fellow at the Tow Center at Columbia University, working on a major research project on User Generated Content and television news. She designed the social media training programme for the BBC in 2009 and went on to train journalists around the world on social newsgathering and verification. For the past two years Claire has been working with Storyful. Claire has a PhD in Communication from the Annenberg School for Communication at the University of Pennsylvania. She is @cward1e on Twitter and blogs at clairewardle.com. Malachy Browne is News Editor with Storyful, the first news agency of the social media age. Headquartered in Dublin and with staff in Asia and the US, Storyful helps its news clients discover, verify and distribute the most valuable user-generated content on social media platforms. Prior to Storyful, Malachy created and edited Politico.ie, an Irish political website and news archive. He worked for the Irish political magazine, Village from 2006 to 2008 and was editor of the magazine's website, Village.ie. Formerly a computer programmer, Malachy strongly believes in newsroom innovation and in the capacity of technology to strengthen journalism. Malachy is from Broadford, County Limerick and lives in Dublin. He tweets @malachybrowne. Mathew Ingram is an award-winning journalist and media consultant who has spent the past two decades writing about business, technology and new media as well as advising companies on their social-media strategy. He is currently a senior writer with the San Francisco-based blog network GigaOM, where he writes about the evolution of media and web culture. Before that, he was the first-ever communities editor -- specialising in social-media development and strategy -- for the Globe and Mail, where he developed the newspaper's approach to online comments, pioneered its Facebook page and launched dozens of writers and editors on Twitter. Patrick Meier (PhD) is an internationally recognised thought leader on the application of new technologies for humanitarian responses. He presently serves as Director of Social Innovation at the Qatar Foundation’s Computing Research Institute (QCRI) where he prototypes Next Generation Humanitarian Technologies. Prior to QCRI, Patrick co-founded and co-directed HHI’s Program on Crisis Mapping & Early Warning and served as Director of Crisis Mapping at Ushahidi. He holds a PhD from The Fletcher School, a Pre-Doctoral Fellowship from Stanford University and an MA from Columbia University. His influential blog iRevolution has received well over 1 million hits. Patrick tweets at: @patrickmeier. Sarah Knight is the Regional Content Director for ABC Local Radio in Western Australia. In her 25 years at the Australian Broadcasting Corporation Sarah has been involved covering a number of emergencies for Local Radio including the Roleystone Kelmscott and Margaret River fires in 2011 and Tropical Cyclone Rusty in 2013 among many others. She has been a lead trainer in emergency coverage practices within the organisation. Sarah looks after staff in six radio stations in Western Australia stretching from the fire and flood prone south to the cyclone, fire and flood prone north. Rina Tsubaki leads Emergency Journalism at the European Journalism Centre in the Netherlands. Emergency Journalism brings together relevant updates and resources for media professionals reporting in and about volatile situations in the digital age. In the past, she managed a number of projects in relation to social media and citizen reporters, and has also contributed to Hokkaido Shimbun, a regional daily in Japan. She was the lead contributor of the Internews Europe's report on the role of communication during the 3.11 Japan quake. Anahi Ayala Iacucci is the Senior Innovation Advisor for the Internews Center for Innovation & Learning and the Internews Humanitarian Media Project. Over the past 4 years, Anahi has worked on the applications of technology and innovation to Humanitarian Crises, Media Development, Conflict Prevention and Human Rights around the world for organizations like the World Bank, UN, NDI and Freedom House. Anahi specializes in the creation of integrated information systems, focusing on the intersection between the online and offline tools, with the aim of covering the "last mile", while still harnessing the power of new technologies. She blogs at anahiayala.com and tweets @anahi_ayala. Tom Phillips lis a senior writer at BuzzFeed UK. He previously worked for UK newspaper Metro, was an international editor at MSN, and most recently helped launch UsVsTh3m, an experimental social-focused "startup" for Trinity Mirror. In his spare time, among other things, he runs Is Twitter Wrong?, an occasionally successful attempt to do real-time fact checking on viral images and tweets. He tweets at @flashboy. Dan Stowell is a computer scientist who specialises in audio analysis. He is also a regular contributor to OpenStreetMap and participates in the Humanitarian OpenStreetMap Team, an initiative that designs digital maps, deploys field workers and creates custom software for disaster risk reduction. He has a background in open-source software development and machine learning, and is currently a researcher at Queen Mary University of London's Centre for Digital Music. His website can be found here. Christoph Koettl is the Emergency Response Manager at Amnesty International USA. He specializes in utilizing satellite imagery, mobile technology and citizen media for human rights research and advocacy. His expertise is in International Humanitarian Law, conflict analysis, crisis mapping and video validation and he is a regular speaker on technology and human rights, including at SXSW 2014. He has testified on war crimes in Sri Lanka before the United States Congress and numerous national and international media, including AP, BBC, CNN, Al Jazeera and Reuters, cover his work regularly. He tweets at: @ckoettl. Philippa Law is a UGC Community Coordinator at The Guardian, where she encourages readers to contribute to stories through GuardianWitness as part of the paper's commitment to open journalism. Prior to this, Philippa was a radio producer at BBC Radio 4, BBC World Service, and CBeebies. She also has a PhD in audience participation for minority language media. She tweets at @philonski and @GuardianWitness. Anthony De Rosa is the Editor-in-Chief at Circa, a true mobile-first news organization. He was formerly the Social Media Editor at Reuters and has over 15 years experience as a technologist for companies such as Newmark Knight-Frank, Merrill Lynch, Bristol Myers-Squibb and Reuters Media. In 2011, he won the award for Best Storytelling Innovation from Reuters for live coverage of events using blogging and social media, and recently won a journalism award from el Mundo. He has also contributed to Gawker, Mediaite, BrandChannel, Nomad Editons, SportsNet New York and IFC; has been featured in The New York Times, Ad Week, New York Magazine, and Details; and consulted for Vox Media. He tweets at: @AntDeRosa. Tom Trewinnard is the Research and Communications Manager at Meedan, a social technology nonprofit working on the Checkdesk project to develop collaborative verification tools online. The live blog of Checkdesk is available both in English and Arabic. Tom has worked extensively with journalists in some of the Middle East's leading newsrooms, as well as with citizen journalists from across the region, to research the role of citizen journalism in the mainstream coverage of breaking events. In March 2013, Tom's case study of Checkdesk was presented at Stanford University's "Right to Information and Technology" conference, and in June 2013 he spoke at the University of Manchester's Citizen Media Colloquium. He tweets at @Tom_El_Rumi. Stephanie Durand manages strategic media partnerships and a range of projects at the United Nations Alliance of Civilizations in New York. She is in charge of organizing media trainings, convening meetings of experts and editors, developing multimedia projects, conducting outreach for an experts website and managing a portfolio of 80+ partners. She previously worked at Sciences Po Paris as the Associate Director of the American Center and then at the Graduate School of Journalism, where she developed the international strategy. Of Franco-German origin, she holds a BA/MA from Sciences Po Paris and a MSc from the London School of Economics in International Affairs. She tweets at @steffidurand. Madeleine Bair is an expert on human rights video advocacy and the role of citizen video in exposing abuse. She is currently the Human Rights Channel Curator at WITNESS, where she leads a team that sources, verifies, and contextualizes citizen video of human rights issues. Before joining WITNESS, Madeleine worked with Human Rights Watch’s multimedia team, creating videos and podcasts to accompany field reports. In 2010, she undertook a University of California Human Rights Center Fellowship, during which she collaborated with Jamaicans for Justice to document police brutality. The resulting video was presented to the Inter-American Commission on Human Rights and continues to be used to inform Jamaicans about police abuse and the justice system. She tweets at @madbair. Caroline Bannock is a UGC community coordinator for GuardianWitness, the Guardian's open journalism platform where readers share their videos, images and stories. She was also a senior news producer and acting foreign-editor for Channel 4 News. She tweets @carlanine. Takashi Ōtsuki is the Deputy Chief of Disaster and Meteorological Center at the NHK News Department, where he is in charge of large-scale disaster preparedness and coverage planning. Previously, he worked at the outlet’s regional branches, the TV News Department and the City News Department, covering various types of natural disasters including the eruption of Mount Oyama on Miyake Island, Mount Usu in the northern part of Japan, and the 1999 İzmit earthquake in Turkey. Gavin Rees, a journalist and filmmaker, is the director of the Dart Centre Europe. The Dart Centre is a project of the Graduate School of Journalism at Columbia University in New York and is dedicated to promoting ethical and innovative approaches to the coverage of trauma and violence. Prior to that, Gavin produced business and political news for US, British and Japanese news channels, and has worked on drama and documentary films for the BBC, Channel 4 and independent film companies. Gavin is also a visiting research fellow at Bournemouth University and is a board member of the European Society of Traumatic Stress Studies and UK Psychological Trauma Society. M.SH is a cofounder of the Shabab Souria (Syria Youth) News group, which he founded with friends after analyzing the dynamic between citizen media and mainstream reporting during the uprisings in Tunisia, Egypt and Libya in early 2011. In the beginning, group members were required to use their real names, before the strategic targeting of journalists and citizen journalists meant that anonymity was vital to ensure the security of the group’s members. M.SH and the other cofounders are IT specialists with a firm belief that technology has a key part to play in bringing change to Syria. Shabab Souria now has over 20,000 members, with admins and founders using private groups to organize activity. Shabab Souria News has come to be a recognized source for many Arab media outlets, including the likes of SkyNewsArabia, Al-Sharq al-Awsat and Al-Arabiyya. © Verification Handbook 2013 - 2016. All rights reserved.